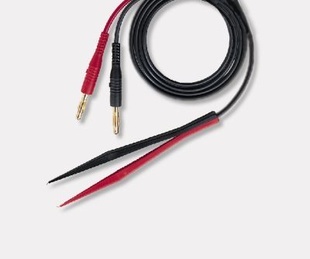 The Keysight 11060A surface mount device probe has a gold-plated beryllium-copper tweezer design that provides an easy method to access and accurately measure surface mount devices. The probe has a rating of 3 A. The Keysight 11060A is compatible with the Keysight 34460A, 34461A, 34401A and 3458A DMMs. It can also be used with the Keysight 34420A, but doing so requires the probe to be rewired onto the Keysight 34104A Low Thermal Input Connector.